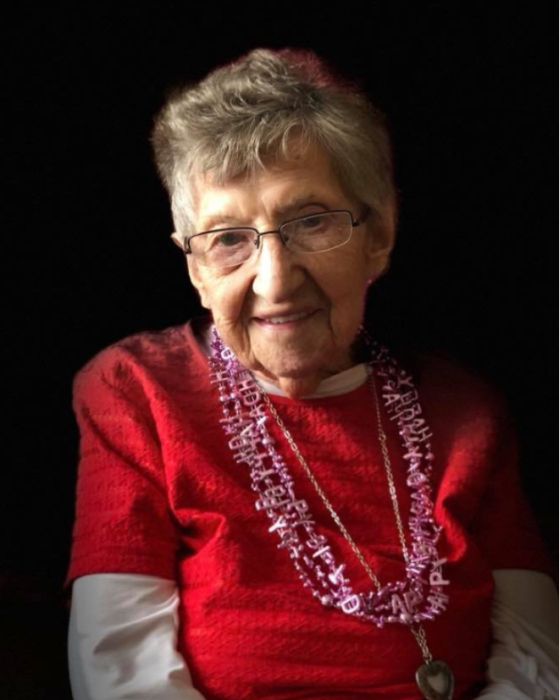 Rosina Flemmer Wallender, beloved mother, grandmother, aunt and friend passed away of natural causes on September 6, 2018 at the age of 97. Services will be held at 10 a.m. CDT Saturday, September 15, 2018, at Zion Lutheran Church, Beulah, North Dakota; with the Rev. Mary Lou Aune officiating. Burial will be in Peace Lutheran Cemetery, south of Beulah. Rose lived through more history than most. Born in 1921 she lived through America’s Prohibition of 1920-33, the Dust Bowl of the Dirty Thirties, and the Great Depression that began with the Stock Market Crash of 1929 and 1939. She was the second youngest child of seven children born to Jacob and Magdalena Flemmer. The family was raised on the family farm 12 miles south of Beulah, North Dakota. Her father died when she was 11 and her mother died when she was 17. She was educated in a rural school near her family farm. Rose was one of a few women in Mercer County North Dakota to participate in one of the New Deal’s National Youth Administration education programs, under the direction of Eleanor Roosevelt. While working on the family farm Rose met Wally Wallender, fell in love and married. They were married for 62 years and had two daughters: Valourie and Patricia. Rose loved to cook and enjoyed baking for her family. She cooked from scratch and would teach her family by saying add a pinch of this or that. She would “taste” and decide how to proceed. She had a green thumb and tended to her plants with care. Rose was employed as a cook for the Joachim Memorial Home in Beulah for many years. Though small in stature she had a strong independent spirit yet a soft and gentle way about her, a demeanor she kept until her death. A farm girl at heart, Rose would comment on the crops and weather as she would enjoy country drives with her daughter and son-in-law. Her knowledgeable comments reflected her respect and understanding of nature. After spending all her life in Beulah, Rose moved to Missoula Montana in 2009 after Wally’s death to be closer to her daughter and son-in-law. Because Rose lost her parents at an early age she dearly loved her family and was happiest when her family was around her. Rose was proceeded in death by her husband, parents, siblings and one daughter, Valourie. She is survived by her daughter Patricia (Scott) McKenzie, 6 grandchildren, Melissa, Lee, Tim (Des), Peter (Ellen), Angela Rose (Ian) and Samuel, two great grandsons, Benjamin and Jack, and many beloved nieces and nephews, their spouses and their children. My mother had a slender small body, but a large heart– a heart so large that everybody's grief and everybody's joy found welcome in it.—Mark Twain. Thanks for always listening Mom. In lieu of flowers, memorials are preferred to Zion Lutheran Church.